Designing my Square Foot Garden raised beds got me thinking about installing drip irrigation in other parts of the landscape. To handle different watering requirements for different garden beds I'll need to split them up into different zones. I don't have an in-ground sprinkler system so I have to come up with a hose-end connected solution like I'm using for my hose-end lawn sprinklers. They do make multi-zone garden hose timers like this Orbit Complete Yard Watering Kit or the Melnor AquaTimer 4-Zone Digital Water Timer but I don't need to have the system run automatically since my area gets plenty of rain most of the year. I also don't want to have garden hoses running all over which are both unsightly and a trip hazard. Instead I figured out a way to to connect multiple drip irrigation zones to a garden hose without having to buy multiple expensive timers or faucet connection kits. Since I use quick connects for most of my lawn watering gadgets (wands, sprayers, Dial-N-Spray, hose-end sprinklers) I'll be using them here too. They really make changing watering accessories quick and easy but you can omit them to save some money if you don't mind taking a few extra seconds to twist on the connections. I'm planning on running two or three different drip irrigation lines for landscaping and vegetable beds that require different amounts of water at different times of the year. When I need to water a drip irrigation zone I'll connect the manual timer and hose end connection assembly to my garden hose, then connect that to the drip zone I want to irrigate. Set the timer for how long I'd like to water and then forget about it until it's done. If I need to water another zone I can quickly connect the hose to the other line and water that after the first zone is finished. It requires me to manually connect the hose to the drip zone but I'm okay with that since I don't need to worry about watering on a regular basis due to my local climate. When I'm done watering, or when the season is over, I can disconnect the timer and hose connection assembly to store indoors. UV rays degrade plastic so the components will last longer if they're not constantly sitting out in the sun. In addition to not leaving the timer and connection kit constantly outside and connected to the hose bib, I don't have to have an adapter to split the flow from the hose bib and have a separate hose to feed it. Having one hose on one hose real is simple and less cluttered. Let's look at the system in detail. 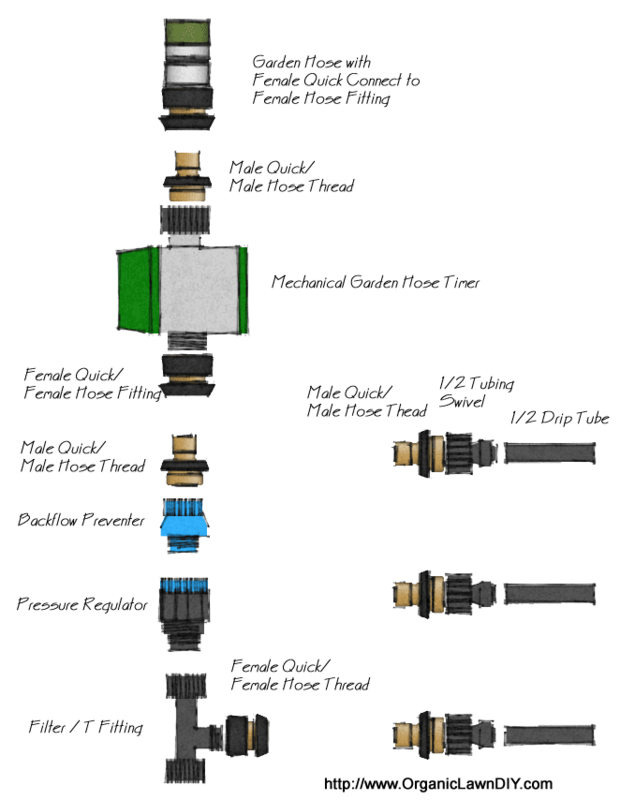 I already have a garden hose with a female/female hose quick connect fitting on it. I just need the timer so that I can set it to water for an hour or so and walk away. I'll also need the quick connects for it. The timer I'm thinking about using is the Orbit SunMate 62034 Mechanical Watering Timer . It's a simple and affordable mechanical timer that has good reviews. It can be set to water for up to 2 hours by just turning a dial. When the time is up it will shut off the water flow. I'll only need one timer regardless of how many drip zones I plan on installing but I can only water one zone at a time. The timer can also be used on it's own with out the other drip specific components to connect to my other hose end sprinklers like the rotor sprinklers I have on spikes for watering the lawn. A backflow preventer - so that water from your hose/drip system don't back up into your drinking water. A pressure reducer - because drip lines run best/last longer when run at about 15-20 PSI which is lower than what a home's typical water pressure is. A sediment filter - to keep grit out of the drip lines which may clog the emitters. A way to attach to the drip tubing since they don't have hose threads. I'm planning on using the Toro 53618 Blue Stripe Drip 1/2-Inch Hose with Emitters every 18 inches because I'd also like to use their 1/4-Inch Drip Emitter Tubing . Unlike other brands of 1/4" emitter tubing, the Toro Blue Stripe 1/4" emitter tubing has emitters spaced every 6 inches which will work better in my raised bed design. The diameter of drip lines can vary from different manufacturers even if they say they're 1/2" so it's important to get the same brand of fittings. For that reason I'm planning on getting the Toro 53756 Blue Stripe Drip Water Source Installation Kit which contains everything I need including the backflow preventer and pressure reducer. I'll only need one drip-water connection kit even though I'll have multiple drip zones. 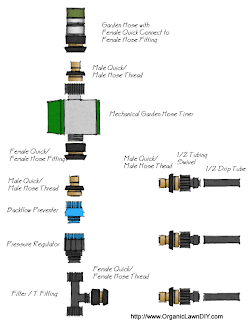 I already have a Back Flow Preventer/Vacuum Breaker attached to my garden hose spigot so I might omit the one that comes with the drip connection kit. For each drip zone, I need to attach one end of the tubing to a to quick connect fitting, through a tubing to hose thread fitting. The Toro 53701 Blue Stripe Drip 1/2-Inch Hose Swivel has 1/2" compression fitting that gets inserted into the 1/2" drip tube and on the other end is a 3/4" female garden hose swivel fitting that I can attach a male quick connect fitting. The hose swivel connectors come two to a pack and I believe they have a mesh filter which will help keep bugs and dirt out of the drip line when not connected to the hose. If not garden hose filter washers can be purchased seperately.